১৭১০ চনত ইংলেণ্ডত গৃহীত "The Statute of Anne"
In the United Kingdom and many other Commonwealth countries, a similar notion of fair dealing was established by the courts or through legislation. The concept is sometimes not well defined; however in Canada, private copying for personal use has been expressly permitted by statute since 1999. In Australia, the fair dealing exceptions under the Copyright Act 1968 (Cth) are a limited set of circumstances under which copyrighted material can be legally copied or adapted without the copyright holder's consent. Fair dealing uses are research and study; review and critique; news reportage and the giving of professional advice (i.e. legal advice). Under current Australian law it is still a breach of copyright to copy, reproduce or adapt copyright material for personal or private use without permission from the copyright owner. Other technical exemptions from infringement may also apply, such as the temporary reproduction of a work in machine readable form for a computer. A copyright, or aspects of it, may be assigned or transferred from one party to another. For example, a musician who records an album will often sign an agreement with a record company in which the musician agrees to transfer all copyright in the recordings in exchange for royalties and other considerations. The creator (and original copyright holder) benefits, or expects to, from production and marketing capabilities far beyond those of the author. In the digital age of music, music may be copied and distributed at minimal cost through the Internet, however the record industry attempts to provide promotion and marketing for the artist and his or her work so it can reach a much larger audience. A copyright holder need not transfer all rights completely, though many publishers will insist. Some of the rights may be transferred, or else the copyright holder may grant another party a non-exclusive license to copy and/or distribute the work in a particular region or for a specified period of time. Copyright may also be licensed. Some jurisdictions may provide that certain classes of copyrighted works be made available under a prescribed statutory license (e.g. 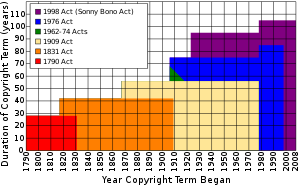 musical works in the United States used for radio broadcast or performance). This is also called a compulsory license, because under this scheme, anyone who wishes to copy a covered work does not need the permission of the copyright holder, but instead merely files the proper notice and pays a set fee established by statute (or by an agency decision under statutory guidance) for every copy made. Failure to follow the proper procedures would place the copier at risk of an infringement suit. Because of the difficulty of following every individual work, copyright collectives or collecting societies and performing rights organizations (such as ASCAP, BMI, and SESAC have been formed to collect royalties for hundreds (thousands and more) works at once. Though this market solution bypasses the statutory license, the availability of the statutory fee still helps dictate the price per work collective rights organizations charge, driving it down to what avoidance of procedural hassle would justify. In the United States, all books and other works published before 1923 have expired copyrights and are in the public domain. In addition, works published before 1964 that did not have their copyrights renewed 28 years after first publication year also are in the public domain, except that books originally published outside the US by non-Americans are exempt from this requirement, if they are still under copyright in their home country (see How Can I Tell Whether a Copyright Was Renewed for more details). But if the intended exploitation of the work includes publication (or distribution of derivative work, such as a film based on a book protected by copyright) outside the U.S., the terms of copyright around the world must be considered. If the author has been dead more than 70 years, the work is in the public domain in most, but not all, countries. Some works are covered by copyright in Spain for 80 years after the author's death. In 1998 the length of a copyright in the United States was increased by 20 years under the The Copyright Term Extension Act. This legislation was strongly promoted by corporations which had valuable copyrights which otherwise would have expired, and has been the subject of substantial criticism on this point. As a curiosity, the famous work Peter Pan, or The Boy Who Wouldn't Grow Up has a complex – and disputed – story of copyright expiry. Copyright, like other intellectual property rights is subject to a statutorily-determined term. Once the term of a copyright has expired, the formerly copyrighted work enters the public domain and may be freely used or exploited by anyone. Courts in the United States and the United Kingdom have rejected the doctrine of a common law copyright. Public domain works should not be confused with works that are publicly available. Works posted in the internet for example, are publicly available, but are not generally in the public domain. Copying such works may therefore violate the author's copyright. Piracy is considered to be the illegitimate use of materials held by copyright. For the history of the term "piracy" see Copyright infringement. For a work to be considered pirated, its illegitimate use must have occurred in a nation that has domestic copyright laws and/or adheres to a bilateral treaty or established international convention such as the Berne Convention or WIPO Copyright Treaty. Improper use of materials outside of this legislation is deemed "unauthorized edition", not piracy. Piracy primarily targets software, film and music. However, the illegal copying of books and other text works remains common, especially for educational reasons. Statistics regarding the effects of piracy are difficult to determine. Studies have attempted to estimate a monetary loss for industries affected by piracy by predicting what portion of pirated works would have been formally purchased if they had not been freely available. Estimates in 2007 stated 18.2 billion potential losses in consumer dollars lost as a result of piracy activities in the United States. International estimates suggest losses in the billions throughout the last decade. However other reports indicate that piracy does not have an adverse effect on the entertainment industry. Permission culture – neologism by Lawrence Lessig. ↑ "Definition of copyright (British & World English)". Oxforddictionaries.com. 2013-01-30. http://oxforddictionaries.com/definition/copyright। আহৰণ কৰা হৈছে: 2013-02-04. ↑ "History of Copyright: Statute of Anne, 1710". Copyrighthistory.com. http://www.copyrighthistory.com/anne.html। আহৰণ কৰা হৈছে: 2013-02-04. ↑ 5.0 5.1 "Copyright Extension". Copyright Extension. http://www.copyrightextension.com/page00.html। আহৰণ কৰা হৈছে: 2013-02-04. ↑ 6.0 6.1 "Berne Convention for the Protection of Literary and Artistic Works Article 5". World Intellectual Property Organization. http://www.wipo.int/treaties/en/ip/berne/trtdocs_wo001.html#P109_16834। আহৰণ কৰা হৈছে: 2011-11-18. ↑ International Copyright Relations of the United States", U.S. Copyright Office Circular No. 38a, August 2003. ↑ Parties to the Geneva Act of the Universal Copyright Convention as of 2000-01-01: the dates given in the document are dates of ratification, not dates of coming into force. The Geneva Act came into force on 1955-09-16 for the first twelve to have ratified (which included four non-members of the Berne Union as required by Art. 9.1), or three months after ratification for other countries. ↑ Parties to the Berne Convention for the Protection of Literary and Artistic Works as of 2006-05-30. ↑ MacQueen, Hector L; Charlotte Waelde and Graeme T Laurie (2007). [Contemporary Intellectual Property: Law and Policy http://www.google.com/books?id=_Iwcn4pT0OoC&dq=contemporary+intellectual+property&source=gbs_navlinks_s]. Oxford University Press. পৃষ্ঠা. 39. ISBN 9780199263394. ↑ World Intellectual Property Organisation. "Understanding Copyright and Related Rights" (PDF). WIPO. pp. 8. http://www.wipo.int/freepublications/en/intproperty/909/wipo_pub_909.pdf। আহৰণ কৰা হৈছে: August 2008. ↑ 13.0 13.1 Simon, Stokes (2001). Art and copyright. Hart Publishing. পৃষ্ঠা. 48–49. ISBN 9781841132259. ↑ The Berne Convention Implementation Act of 1988 (BCIA), সাঁচ:USPL, 102 Stat. 2853, 2857. One of the changes introduced by the BCIA was to section 401, which governs copyright notices on published copies, specifying that notices "may be placed on" such copies; prior to the BCIA, the statute read that notices "shall be placed on all" such copies. An analogous change was made in section 402, dealing with copyright notices on phonorecords. ↑ "U.S Copyright Office - Copyright Law: Chapter 1". http://www.copyright.gov/title17/92chap1.html। আহৰণ কৰা হৈছে: 2011-11-16. ↑ 25.0 25.1 WIPO Guide on the Licensing of Copyright and Related Rights. World Intellectual Property Organization. 2004. পৃষ্ঠা. 15. ISBN 9789280512717. ↑ WIPO Guide on the Licensing of Copyright and Related Rights. World Intellectual Property Organization. 2004. পৃষ্ঠা. 8. ISBN 9789280512717. ↑ WIPO Guide on the Licensing of Copyright and Related Rights. World Intellectual Property Organization. 2004. পৃষ্ঠা. 16. ISBN 9789280512717. ↑ 28.0 28.1 Creative Commons Website http://creativecommons.org/ retrieved October 24, 2011. ↑ Nimmer, David (2003). Copyright: Sacred Text, Technology, and the DMCA. Kluwer Law International. পৃষ্ঠা. 63. ISBN 978-9041188762. OCLC 50606064. http://books.google.com/books?id=RYfRCNxgPO4C. ↑ "Copyright Term and the Public Domain in the United States 1 January 2008. ", Cornell University. ↑ "Stanford Center for Internet and Society". Web.archive.org. Archived from the original on 2006-10-27. http://web.archive.org/web/20061027134508/http://cyberlaw.stanford.edu/about/cases/emily_somma_v_gosh_peter_.shtml। আহৰণ কৰা হৈছে: 2010-05-08. ↑ Owen, Lynette (2001) Piracy Association of Learned and Professional Society Publishers 14(1) p. 67. ↑ Owen, Lynette (2001) Piracy Association of Learned and Professional Society Publishers 14(1) p. 68. ↑ 40.0 40.1 Staff (2007) Piracy Statistics around the World "Video Business" 27(28). ↑ "Urheberrechtsverletzungen im Internet: Der bestehende rechtliche Rahmen genügt". Ejpd.admin.ch. http://www.ejpd.admin.ch/content/ejpd/de/home/dokumentation/mi/2011/2011-11-30.html। আহৰণ কৰা হৈছে: 2013-02-04. Dowd, Raymond J. (2006). Copyright Litigation Handbook (1st সম্পাদনা). Thomson West. ISBN 0314962794. Gantz, John & Rochester, Jack B. (2005). Pirates of the Digital Millennium. Financial Times Prentice Hall. ISBN O-13-146315-2. Patterson, Lyman Ray (1968). Copyright in Historical Perspective. Vanderbilt University Press. ISBN 0826513735. Rosen, Ronald (2008). Music and Copyright. প্ৰকাশক Oxford Oxfordshire: Oxford University Press. ISBN 0195338367. Steinberg, S.H. & Trevitt, John (1996). Five Hundred Years of Printing (4th সম্পাদনা). প্ৰকাশক London and New Castle: The British Library and Oak Knoll Press. ISBN 1-884718-19-1. Story, Alan; Darch, Colin & Halbert, Deborah, ed (2006). The Copy/South Dossier: Issues in the Economics, Politics and Ideology of Copyright in the Global South . Copy/South Research Group. ISBN 978-0-9553140-1-8. Copyright Berne Convention: Country List List of the 164 members of the Berne Convention for the protection of literary and artistic works.